After experimenting with many recipes, reading up on various methods, and trying out different kinds of flours, I have finally tweaked a recipe that works for our family. 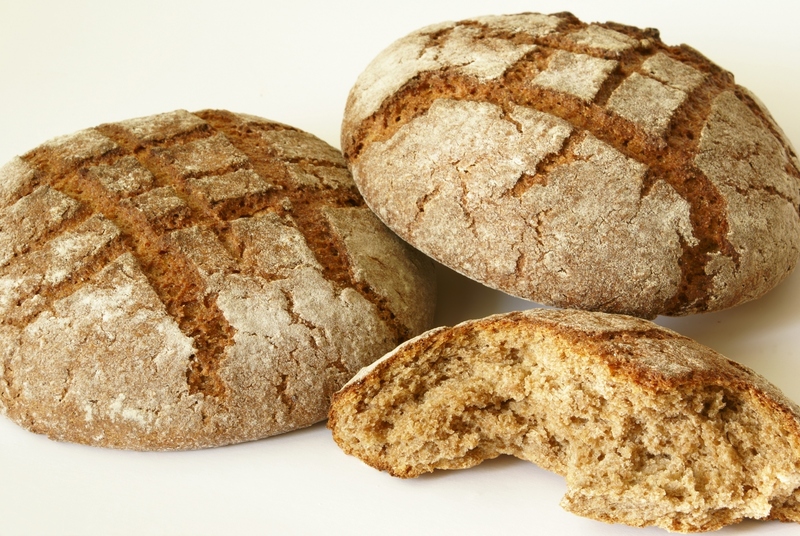 I wanted one made with freshly milled barley and spelt. Barley is lower in gluten, glycemic index, and boasts a host of nutrients. Spelt is an ancient variety of wheat that has more protein, B vitamins, and minerals among other nourishing elements. Why sourdough? Read the unparalleled benefits of sourdough here and here. For the starter itself, I have been using organic whole wheat pastry flour. I have yet to convert the starter over to spelt completely, but would like to eventually. Using hand sifted spelt has also proved to help in creating a lighter loaf that rises better. Using the ideas from Vintage Remedies’ Guide to Bread as a basis, here is my version of a whole grain spelt loaf. The following is enough for 4 loaves. Starting with about 1 cup of starter, I pull it out of the fridge in the morning, the day before I want to bake the bread. I feed it several times until it is up to at least 4 cups, active and frothy by evening. For the first feeding, I add 1 cup flour and 3/4 cup water. The second feeding, about 5 hours later or so, I use 2 cups flour and 1 1/2 cups water. After dinner time, it should be ready to use. I reserve 1 cup of the starter for future use and store it in the fridge unless I plan to bake more sourdough sooner than later. Turn mixer on the lowest setting and slowly add each cup of flour. Mix the dough on a higher setting for 5 minutes (setting 3 for 5 minutes on a Bosch and the middle setting for the KitchenAid for about 7 minutes). The dough will be wetter than yeast bread, but not overly so. It should want to stick to itself more than it wants to stick to you. It should be elastic and stretch easily. Transfer flour to a non-metal container with room for expansion. Close the lid (or put wrap on top) and place in the fridge for about 12 hours (or overnight). The next morning, grease 4 loaf pans well, and flour with brown rice flour (this will prevent sticking without absorbing into the dough much – I use palm shortening as the “grease”). Divide up the dough into 4 equal parts, using brown rice flour for dusting as needed. Roll each part into a loaf and plop into each greased pan. Let rise on the counter for 7-12 hours (shorter if summer). It should get just above the edge of the bread pan. (Remember that spelt does not rise as high as wheat will.) If you let it rise too long, it will deflate. No worries, it is still good to eat, just not as pretty. Bake in a preheated oven at 375 for about 45-55 minutes. The internal temperature should be between 190 and 210 F. (I took the temp the first few times to get the hang of it, once you know what it will look like, it won’t be necessary.) – Optional Bake with dutch oven —- bake at 420 for 15 minutes with the lid on, take lid off and bake at 350 for another 35 minutes. Take out of oven, and immediately transfer loaves to a towel, on their side preferably so as not to make the bottom soft. Allow to cool for at least 20 minutes (if you can wait that long) to help the bread to settle and adhere better. I usually freeze the bread after it has cooled to keep it fresh (except for 1 loaf for the next day, which I put in the fridge). Enjoy with your favorite spreads, cheeses, meats, etc. Have fun experimenting! It takes a while to get the hang of it, but it’s worth the effort and trials. Lower glycemic, low gluten, nourishing bread has been the staple of homes for centuries. May you learn to recover this lost art and enjoy its amazing benefits. Hi Gina! Do you order your starter? Or do you make it yourself? I wasn’t sure about that part of the recipe…maybe I missed something, though.